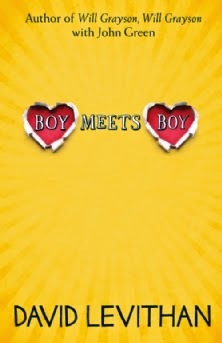 Boy Meets Boy is about Paul, an average high school student who has boy problems, friend problems - every usual kind of teenage problem apart from his sexuality. That was never in question since Paul is openly gay and everyone around him is okay with that. The book also follows several other characters, within the same friendship group, who each have their own story lines and problems. Boy Meets Boy simultaneously entertained and disappointed me. I liked Paul - the main character. I liked how most of the characters were so openly LGBTQ* and it wasn't something that needed explaining or justifying, as some books do. Most of the story involved a love triangle of sorts and I didn't enjoy that. I could see the main drama coming and when it happened, I had no sympathy for the main character and found myself disconnecting from him. Another aspect I had a big from with was that I felt as though there were so many characters with their own issues, it was hard to connect to any of them. The book would have been much better if it had focused on fleshing out one or two of the characters, rather than kind of half creating so many and not giving them much depth. I did enjoy reading the book and the romance aspects were swoon-worthy, but the characters were underdeveloped and the story line was kind of basic. The book was quite short and it is a good addition to LGBTQ* literature, but I wouldn't re-read this book.